Lionel Messi scored twice as Barcelona beat Tottenham 4-2 in a Champions League Group B clash at Wembley Stadium on Wednesday night. 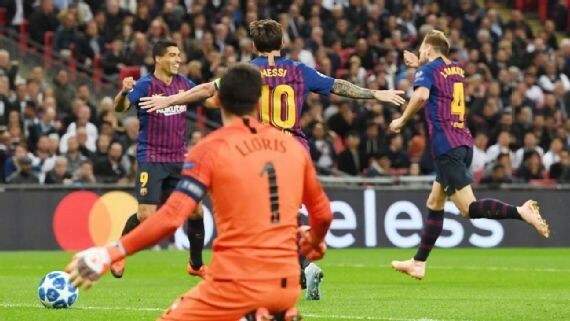 Philippe Coutinho put the visitors ahead within two minutes, smashing a half-volley into an empty net, after Hugo Lloris was caught out trying to chase down a Messi through ball. Ivan Rakitic made it 2-0 with a stunning half volley, before Harry Kane pulled one back in the second half. Messi scored either side of Erik Lamela’s deflected effort to make it two wins out of two for the Spanish champions. Napoli edged Liverpool 1-0, thanks to a late Lorenzo Insigne winner. PSG hammered Red Star Belgrade 6-1, Inter Milan won 2-1 at PSV and Borussia Dortmund beat Monaco 3-0 in other fixtures.